1) Buy quality. It might seem obvious but, the higher the quality of the original cut, the better the final meal it will taste. Ask your butcher (or our customer service team!) for something that has been dry-aged for at least 21 days (you'll be able to tell by the colour - the meat is a darker reddy brown meat and the fat slightly yellowed fat differentiated this from a supermarket, wet aged cut), and preferably grass fed (the marbling of the cut will be indicative of this). Take a look at a couple of recent posts on the benefits of both dry-aging and grass-fed beef for more info. 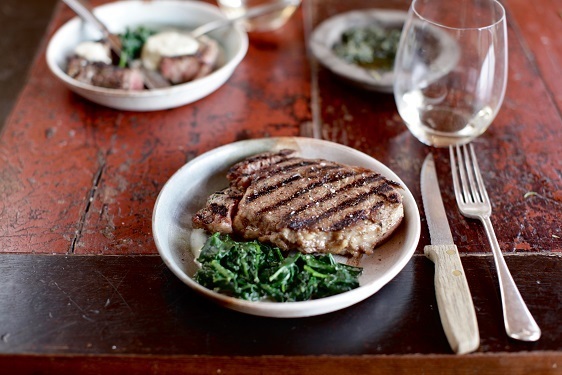 2) Ensure your steaks are at room temperature before cooking (this can take a couple of hours). Doing so will make it easier to get a nice crust on the outside while keeping the inside nice and tender. Take them out of the fridge and pop them on a chopping board somewhere they won't get in the way. 3) Use a heavy bottomed, griddle pan on your hob. A thick bottom helps the heat spread more evenly across the pan and, in turn, across your steaks, helping you nail that perfect medium rare. 4) Whether it's the BBQ or pan, it needs to be hot. Really hot. 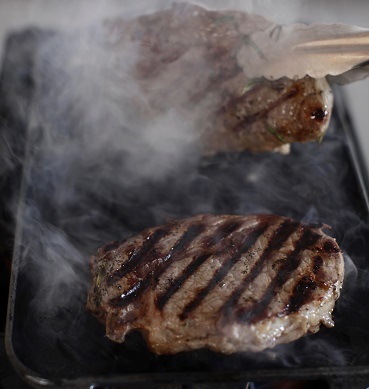 A pan needs at least 5 minutes over a high heat and should be beginning to smoke - get the extractor fan running! 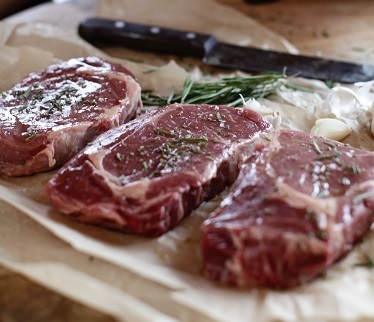 5) Make sure your steaks are dry by patting them with a paper towel. Doing so will help develop that delicious external crunch, as a contrast to the internal tenderness, whilst also preventing moisture boiling in the pan, which can remove some of the flavour of the meat itself. 6) Just before you pop them in the pan, generously season them with sea salt and freshly ground pepper. There are a couple of ways of doing this - we prefer actually seasoning the board and giving the steaks a quick flip. 7) You shouldn't need any oil in your pan as if it's hot enough, steaks sticking to the pan won't be an issue. If you are keen to though, we'd suggest using peanut or rapeseed oil as these stand up to high temperatures better than olive or veg oil. 10) Cook to your preference, and then rest somewhere warm for 5 - 10 minutes so that the meat can re-absorb some of the delicious, fatty juices. Serve and enjoy!